Amazingly, it’s been almost ten years since J and I moved to Michigan….and eight of those years we’ve been in Kalamazoo. I started this blog as Mid-Michigan Dining when we lived in Lansing. When we moved to Kalamazoo, I started the current iteration. If you’ve read this blog for any time, you’ll know how much I love Italian beef sandwiches. They’re easily one of my favorite foods and I look forward to every trip to Chicago to get one. It’s hard to find a good one in Michigan. There are a few places that do a pretty solid job. There are a lot of places that do a pretty awful job. Finding the good places means going through the bad ones. 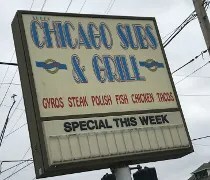 The first place I found that had an Italian beef in Kalamazoo was Chicago Subs & Grill. 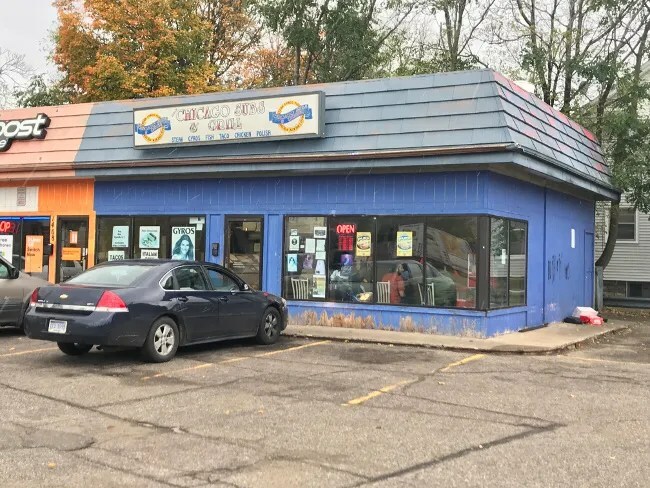 About a month after we moved to Kalamazoo in 2009, I drug J to this little sandwich shop on the corner of Portage Road and Stockbridge Avenue looking to get my fix. I was happy with what we got….not blown away by any means, but I liked the sandwich. I drove by the shop a few weeks ago and realized I have never been back since that first visit. Earlier this week I had time for a lunch break so I decided it was time to change that. 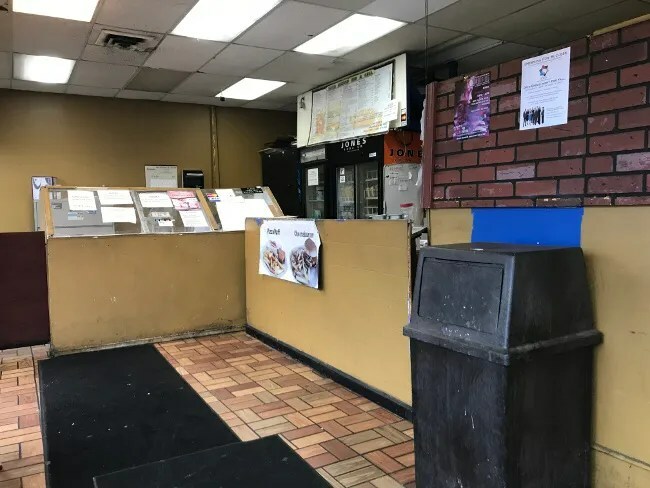 Chicago Subs & Grill isn’t the most inviting building in the world. The sign is fading. The paint is peeling off the wall. It’s a restaurant that’s been around for a while and very little attention has been paid to the appearance of the building. There’s a large parking that’s shared with a Boost Mobile that also shares the building on this corner. This is one of the rare neighborhood sandwich shops in Kalamazoo so there’s also a lot of walk-in business from the surrounding neighborhoods. I walked in about 12:30 on a Tuesday afternoon. There were five or six people in the small space and only one person working behind the counter. Like the outside, the inside of the restaurant could use a little TLC. There’s an old ice cream case off to the right that just have stuff stacked on it. Right in front is the order counter where the large menu is attached. The lone guy working the store looked out from behind the wall that separates the kitchen from the order area and just kind of sighed. He was already working on a couple of big orders and people were stacking up right inside the door. He didn’t take my order but instead continued working on the three he already had leaving myself and three other people just waiting there. That became an issue when he did finally start taking orders. I was standing at the counter so he looked at me and asked what I wanted. Another guy, who had been there longer, was on the phone sitting on one of the chairs and he didn’t like the fact that I ordered ahead of him. It wasn’t intentional but he wasn’t acting like he was in line and he was on the phone and not paying attention. When I realized the mistake, I tried to smooth it over by offering to buy his lunch but he still wasn’t happy and walked out. I put in my order for the Italian Combo which comes with fries and a pop. The total was $8.50 which I paid for with cash but they do accept credit as well. There is no dine in space but there is a small waiting area with some seats along the window. 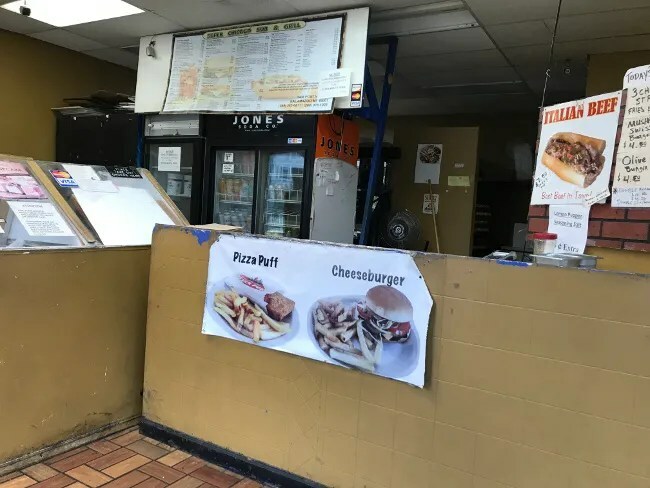 There are signs in a couple different places reminding people that this is a carry-out only place and they’re not to sit an eat in the waiting area. It took about ten minutes for my food to be put together and put in a white paper bag. 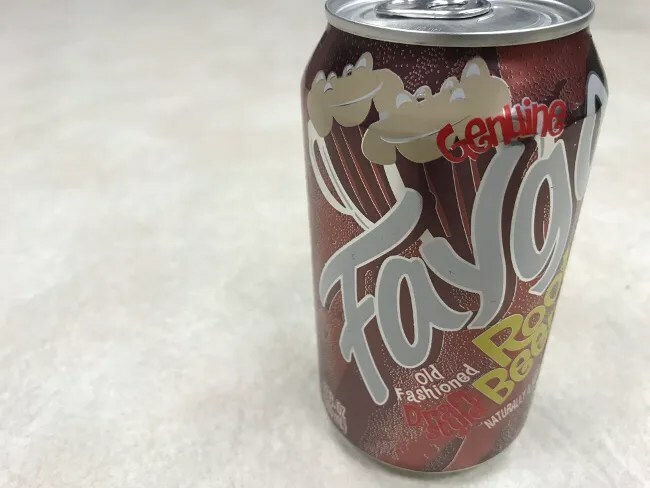 The pop options are all off-brand cans and Faygo. They didn’t have much of a selection but I noticed a can of Faygo Root Beer so that’s what I asked for. I was able to get in to the fries right away despite the fact they were fresh out of the fryer. They were simple fries. Just the typical restaurant fries. They were hot and crispy but needed a little salt or something. 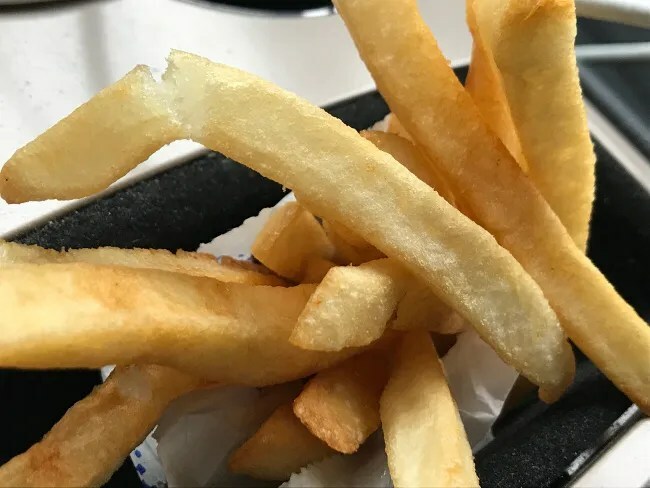 They were fine as far as sandwich shop fries go. Most people would eat them with ketchup but I’m just not a ketchup eater. I had to wait to get back to the office for the sandwich. The Italian beef was double wrapped in wax paper and aluminum foil. 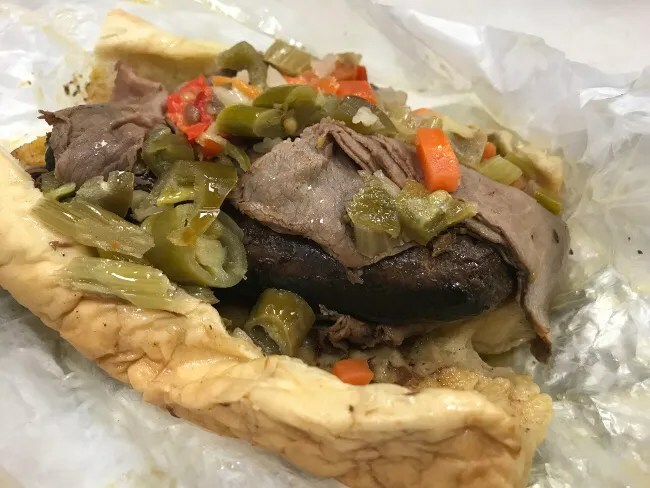 I ordered the Italian combo which includes both the Italian beef and an Italian sausage in the hoagie roll that is then topped with the hot pepper mix. The beef was a little tough but had a good flavor. The sausage really kind of saved this sandwich. The sausage was very tender and pretty spicy. At first I thought I was getting the spiciness from the peppers but I soon realized, the sausage was contributing to that as well. Overall, the sandwich was alright. It’s something I would eat again but it didn’t blow me away. Chicago Subs & Grill is good for what it is…a neighborhood sandwich shop. The only thing I’ve ever gotten from there is the Italian beef so I don’t know how other things are, but this is the type of place you go to when you want something quick, greasy, and don’t want to cook yourself. Nothing they have is going to blow your socks off, but you will get a decent sandwich at a pretty good price.